The university catalog is a comprehensive source for university policy. Advisors can assist students in navigating policies and procedures relevant to them. At any point in your program, you can check your program progress by running a degree evaluation in Patriotweb. If you are in both the M.Ed. and a certificate program, you must view your degree progress separately for your primary program (generally M.Ed.) and your secondary program (generally certificate) to determine which course/credit requirements are remaining for each program. If you've not yet added your secondary program, follow the "What if" instructions to perform an evaluation on the program you intend to add. Many students will complete both an MEd program and a licensure or non-licensure certificate program. These students apply initially to the MEd, which will be their primary program. They will then complete the top section only of the Graduate Secondary Certificate Program Application and submit the form to their advisor to add the certificate program as a secondary program on their record. Students can verify the programs of study on their records, by viewing the unofficial transcript in Patriot Web and looking at the Current Programs section. Students must be enrolled in a certificate program at least one semester before graduation from it. Students adding licensure certificate programs are required to have official, passing Praxis Core Academic Skills for Educators or state approved substitute. on their record prior to adding a licensure certificate program. Courses taken prior to admission to your program, including Mason non-degree status, must be transferred into your program. Courses must meet the university requirements for transfer credit and the course content must be approved by faculty as being equivalent in content to coursework in the Mason program. Coursework should be submitted for review during the first year of a program. Our program is comprehensive and offers all of the coursework you need to complete your programs. If for some reason you cannot complete a course at Mason, you may submit a Request Permission to Study Elsewhere form. If approved, you will be able to register and complete the course at another university. Once you have completed the course, you will need to submit an official transcript to the Registrar to transfer the course into your program. Students in graduate programs must maintain a 3.00 GPA (B average). Grades of B- or better are required for all education course work for licensure. Only 6 credits with grades of C will be allowed for completion of the Master's degree. A grading scale will be determined by faculty for each course and will be provided on the syllabus for that course. Most courses are graded with standard letter grades such as A, B, C, and F. It is at the discretion of the instructor to assign letter grades with + or -. Classes in which students receive a C or lower are not eligible for licensure approval via GMU. A degree-seeking graduate student is dismissed after accumulating grades of F in two courses or a total of 9 credits of unsatisfactory grades (C or below) in graduate courses. 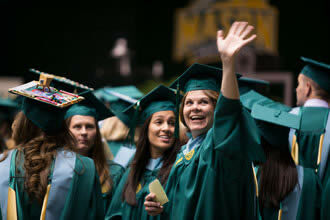 Although the university will make every effort to notify students when their performance reaches the threshold for dismissal, each student is responsible for knowing the dismissal criteria for degree-seeking graduate students at Mason, for knowing when their grades have met the standard, and for initiating any appeal to the dean. A student who is dismissed may not take additional course work at Mason.